Our guest blogger Amanda Tracey is from St. John’s, Newfoundland and Labrador, and started her blog All She Does Is Eat to share her favourite recipes and tips to living as compassionately as possible. She now lives in Vancouver and works as a communications professional and blogger. 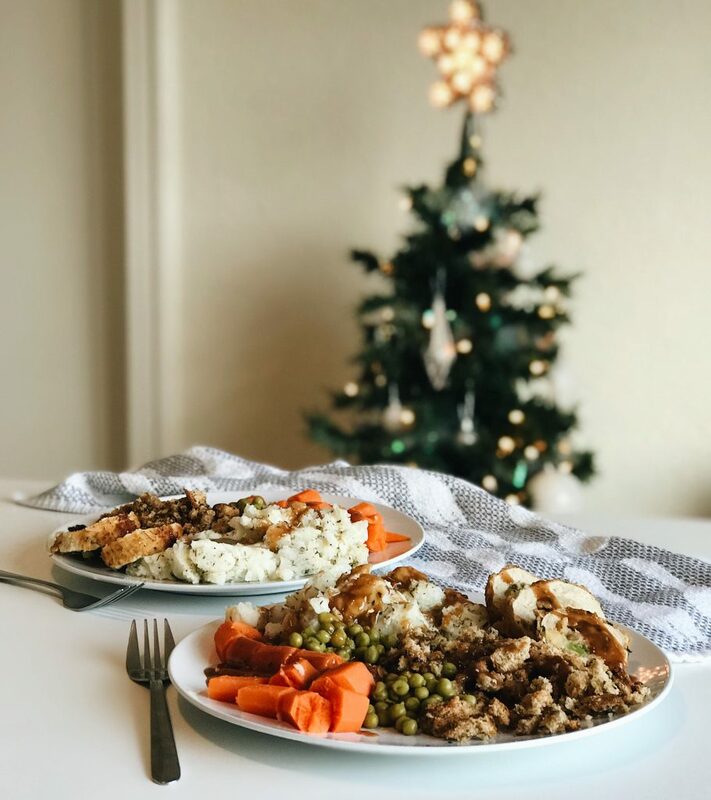 When I first adopted a vegan lifestyle, one of my worries was “how am I going to participate in the holidays?” I was concerned that my veganized recipes wouldn’t live up to the part – but boy was I wrong. Growing up I always thought the turkey was the centrepiece of the dinner, but my favourite things were always the potatoes, stuffing and gravy (I’m pretty sure gravy runs through my veins). So, for me personally, I’ve never missed the turkey. I’ve been vegan for three years, and it was only last year that I decided to step my game up. I’ve had family and friends try everything I am going to share with you here, so I am 101% positive that you will like it. I’ve taste-tested the Tofurkey roast and it wasn’t really my thing. Other people I know really enjoy it, but my favourite is the Gardein roast. If you don’t like either, you could try a roast like this one from hot for food or you can just stick with a bunch of delicious vegetables. But for me, I’m going with the Gardein roast. Just bake it according to instructions. It’s very straightforward! As for the rest, keep reading for the recipes. *A little note, all of the above serves 2 people (fairly big plates though). Make sure to double or even triple each recipe depending on how many guests are joining you! 1. Peel and wash your potatoes and carrots. Then place them in a medium to large sized pot, and boil them for 20-25 minutes. They will be fork tender when finished. 2. For the stuffing, crumble your bread by hand in a bowl or in a food processor. Add the butter to your bowl, along with the parsley flakes, garlic powder and Italian seasonings. To bake, add to a small casserole dish and cover with tinfoil. Bake for 20-25 minutes on 450F. Once done it is ready to enjoy! 3. Cook your Gardein roast according to package. So yummy! 4. In a food processor, blend your garlic clove until it’s broken into small pieces. Add the vegetable broth, apple cider vinegar, soy sauce, maple syrup, sea salt and black pepper. If you don’t have a food processor, mince your garlic by hand and add all ingredients to a blender. Heat the butter in a small pot. Once melted, add the all-purpose flour, whisking immediately. It will be a thick paste. Let cook for 1 more minute, and then add your blended ingredients. Whisk again until fully combined. Bring to a boil, and then simmer for 5 minutes on low heat. Now it is ready to serve! 5. You can either eat your potatoes plain like the carrots, or you can whip them up a bit more! In a small bowl (big enough to fit all potatoes), mash the potatoes with a fork or potato masher. Add the almond milk, garlic powder and Italian seasonings. Stir together until fully combined. 6. For the peas, drain and rinse them and then heat them up in a small pot/pan or the microwave. Whichever is easiest!